“The Art of the Journey”, an exclusive publication and exhibition comprising a private art collection of 170 original art pieces from established and emerging artists in the Asia-Pacific region, will be launched on the evening of April 10 at Pan Pacific Hanoi. Thirty-seven stunning pieces representing the definitive works of more than 20 of Vietnam’s most respected and beloved artists will also be displayed for the first time from April 10 to 16 with free entry, in partnership with Blue Gallery. Through a thoughtful, sensitive curation process that bridges select foundational works of the late 1980s and early 1990s with that of modern Vietnam, the “Art of the Journey” is a showcase that celebrates and affirms artistic talent, then and now, in Vietnam. Highlights include art pieces by the late Nguyen Tu Nghiem, one of Vietnam’s pioneering and most influential artists, Dang Xuan Hoa, who is regarded as one of the most important artists of the late 20th century, and Nguyen Trung, the “Father of Vietnamese abstract art”. Together with works by “horse painter” Le Tri Dzung, Dinh Quan and Quach Dong Phuong - who have exhibited widely around the world - these treasures symbolize the backbone of Vietnamese contemporary art and form an indelible part of the local heritage. Seminal art pieces on display include Le Tri Dzung’s “The Tale of Kieu” on traditional “Do” paper, which is a powerful interpretation of Vietnam’s best-known piece of literature of the same name about an ill-fated pair of lovers, and the late Nguyen Tu Nghiem’s “The Dancers”, which was painted 35 years ago. A master artist famed for his series of traditional dancers, Nghiem was influenced by Vietnamese folk art and magnificently blended Post-Impressionism with local subject matter. 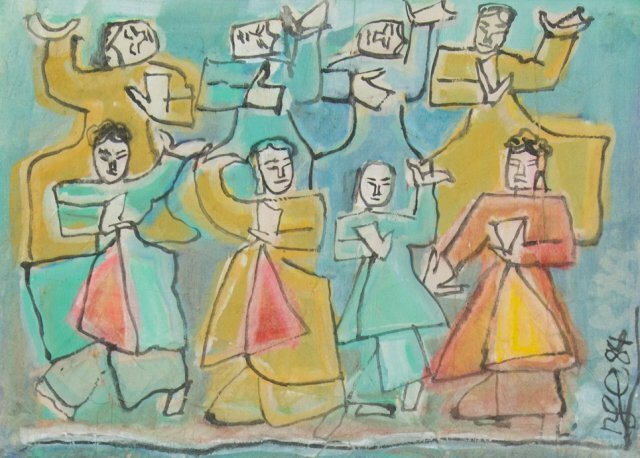 During the course of his long life (he died at the age of 93 in 2016), he became one of the most-acclaimed artists of his generation and influenced the next generation of artists, including Dang Xuan Hoa. The artists themselves - Dang Xuan Hoa, Le Quang Hoa, Le Tri Dzung, and Quach Dong Phuong, among others - will be supporting the launch of the showcase with their presence on April 10. As part of Pan Pacific Hanoi’s community efforts, the hotel will be holding a charity auction, with all proceeds going towards KOTO, a local social enterprise that trains disadvantaged and at-risk youths for a career in hospitality.